Today we are delighted to bring you a premiere via international metal promotions company Dewar PR. 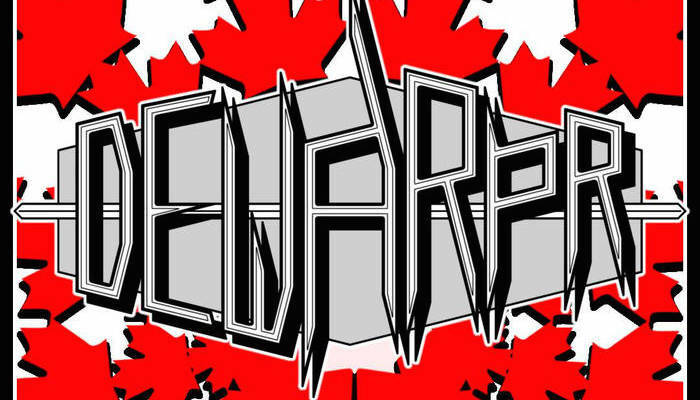 Head honcho Curtis Dewar has assembled some top notch bands with an eclectic mix of genres, and a cheeky album cover to represent his homeland of Canada. We won’t be able to go through all 28 tracks, but here’s an overview of some of what’s on offer. Death metal fans have their work cut out: Canada’s VHS bring a gore-infested sound to the table, while Dismemberment (Ohio) take a thrashier and blackened route. Meanwhile, Deconstructing Sequence (England) muscle through progressive and avant-garde territory, and Frank’s Enemy combine crazy deathgrind with a Christian edge, from the mind of Julio Rey of The Lead. Meanwhile, worshipers of the doom-, sludge- or stoner-fueled riff can look to English soils for the phenomenally heavy Greenhorn out of Bournemouth (with a track featuring Conan’s Jon Davis) or London’s appropriately-titled Sloth. The US is also well-represented though, with industrial-leaning Cleansing The Damned (Washington) and the crawling sludge metal of Unmothered (Texas). The melodic end of the spectrum has a look in too: My Own Chaos from Canada have a brand new hard rockin’ track with a gorgeous acoustic intro, while Finland’s Edge Of Haze bring a genre-melding blend of gloomy yet catchy progressive metal. Melodic death metal gets a peek in as well, with two extremely promising young bands: Countless Skies (England) for a Finnish-sounding gloomy ambience and Archaea (Sweden) for a thrashy yet symphonic spin on Gothenburg’s style. And for a taste of the unconventional, look no further than Scotland’s Slugdge, England’s Donkerkarnuffel and Pravitas or Texas’ Death Motif. Slugdge are a mollusk-worshipping extreme metal band in the vein of Anaal Nathrakh, whose previous releases are simply stellar. Donkerkarnuffel are a meaty death metal band with a fixation for nightmarish clown apocalypse. Pravitas are a phenomenal young tech-death band whose song title means ‘ice cream’ in Finnish, and Death Motif are a swampy yet angular take on black metal not unlike Regarde Les Hommes Tomber. All of this and more is available on the compilation, and the best method is to dive in and sample every track on it. You can pick it up for free download on the site’s Bandcamp page, or stream it below. You can follow Dewar PR on Facebook here or Twitter here.